Bus from Malacca to Muar is the most affordable and convenient mode of transport to travel between the two cities. As compared with driving your own car from Malacca to Muar, taking a bus is often a great option because you can always take a rest during the whole journey. S&S International Express and Mayang Sari Express are two bus companies offering daily bus service from Malacca to Muar. S&S International Express is the dominant player in this route service by having up to 5 daily trips while Mayang Sari Express only having 1 daily trip. The first bus service provided by S&S International start in the early morning 8.00am. The last bus service provided by Mayang Sari Express is 8.00pm. The bus from Malacca to Muar just takes about 1 hour to 1.5 hours depending on the road traffic condition. Even in a short journey, passengers can always request for a washroom break upon from the driver during the journey. The ticket fare for bus from Malacca to Muar is priced in a range of RM 4.60 to RM 5.20. In fact, the price variation is mainly due to the bus type. Standard 40 seater bus fare is cheaper at RM 4.60 for adult and RM 3.50 for child. VIP bus ticket costs higher at RM 5.10 for S&S International and RM 5.20 for Mayang Sari Express. Bus will pick up all the passengers at Melaka Sentral Bus Terminal, which is located 15 minutes away from Malacca town area. When arriving Muar, the bus driver will drop off the passengers a Muar Bus Terminal. 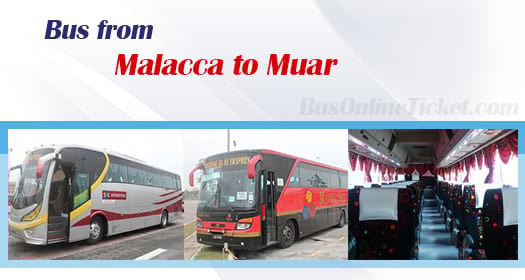 Due to limited bus schedule daily from Malacca to Muar, passengers are advised to book Malacca to Muar bus ticket online at BusOnlineTicket.com to avoid disappointment. Booking is instantly confirmed upon payment. BusOnlineTicket.com accepts Paypal, Visa and Master credit card, Alipay and many other payment methods to book your bus ticket.